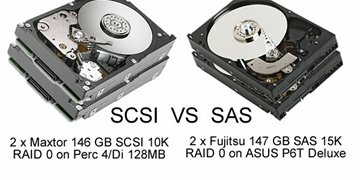 Now that the server world is heavily adopting SATA drives and SAS drives for those who want extra performance, there are a lot of people wondering how this technology compares to the old IDE and SCSI drives. Time for some performance benchmarks to put this question to rest. If you have ever run into the problem of buying or selling something on ebay, only to have it not work once it reaches it destination, you know the kind stress this creates. Basically the Dell Poweredge 1750 Server I had was not booting up, and would flash an orange / amber light on the front, and had no display, and no beeps. The solution was pretty simple, Reseat everything! I finally got my new workstation up and running. I will post some photos of the actual unit soon. But for now I wanted to share these bench marks with everyone. No need to get a dedicated RAID card, the build in SAS RAID support from the ASUS P6T x58 motherboard gets the job done just fine.